If you’re looking for a decent knife that won’t break the bank, The Smith & Wesson SWHRT9B Black HRT might be just what you’re looking for. If you’re in a hurry, check it out here at Amazon. I wanted something that wasn’t folding and would still fit me without being too long or uncomfortable. This knife not only fits me like a glove, it also has the full tang I wanted. The black leather sheath is adjustable so it’s an easy fit on my belt, which means I don’t have to buy a second one. The price was also a real selling point for me since I’d considered an ESSE as well but this was better priced. This knife is a really nicely balanced knife since the blade and handle are close and it feels comfortable to hold. At 0.5lb it’s noticeable if I’m wearing it in my boot but not enough that I feel unbalanced which makes me feel much more secure than if it was too light. This is honestly one of my favorite knives and definitely the best boot knife. This is a dual edged 7Cr17 carbon steel spear point blade. Carbon steel is much harder and this is a Nickel/Aluminum blend that is resistant to salt water. I spend a lot of time out by the ocean so steel rusts quick and having a blade that is specifically resistant to saltwater made this a no-brainer. The steel itself holds a reasonable edge and is also quite tough. While it’s superfluous to my needs the blade also has a blood groove which would be good if you’re using it for hunting or fishing but depending on your state this might make it illegal to carry. The full tang is also more reliable than a folding and less likely to break since there’s no weak spot. The size of this is great for me, It’s a total 9” in length – which means that I can still fit it in my boots without it practically poking me in the knee, and I’m certain this would work for someone taller as well without getting in the way or being uncomfortable. The handle is 4.25” which fits comfortably without feeling large to my small hands and it’s not too heavy to handle either. The blade is 4.75” which is a little bigger than I wanted but it’s actually more versatile than the shorter blades I had considered. It fits easily into my short boots or long boots. I’m really keen on the leather sheath too. Originally I was looking for some sort of polycarbonate that I could wrap with mole skin but this works great, the leather will warm and mold to your body over time which means that it will take on the same shape as your ankle and boot eventually while still protecting the knife – nifty and comfortable. While this is too big for me to want to put it on a belt the option is there and I would say that is very useful if you only want to carry one knife. The knife is made in China and licensed by Smith and Wesson rather than actually being made by them. The steel is blacked out so it doesn’t reflect light – good for a tactical defense advantage. It’s a functional knife that fits comfortably into a boot without being too long. If you want something to wear as a boot knife then this is sturdy and functional without costing a fortune. The downside with this knife is that it is made in China, and quality control can be a bit lax so some can be defective. But, at this price I would recommend the Smith & Wesson SWHRT9B Black HRT. This would be good for an outdoors person or someone who needs a basic defense knife that is versatile enough to fit on the hip or in a boot. It’s also ideal for someone who is working on a budget or who isn’t sure if they’re comfortable wearing a boot knife. I would recommend this if you’re taller because it will be less noticeable but it will work for someone short like me also. This isn’t a high-end knife so it’s not ideal if you want hand stitched leather or an edge that holds forever since this doesn’t hold an edge compared to other types of steel. It’s also made in China so it’s not for someone who insists on buying American products. I would not recommend this for someone who isn’t used to carrying a boot knife either because of the size and would probably recommend a folding knife instead if you want something really small. Click here to check out the Smith & Wesson SWHRT9B at Amazon. China, but it is licensed by Smith & Wesson to Taylor Enterprises and sold by them. The knife can be used as a concealed weapon for self defense, or for hunting/fishing but it’s missing a skinning or gutting edge. The knife is a total of 9” long with a full tang blade that measures 4.75” and a handle that is 4.25”. Both edges are sharpened and while it comes sharpened you may want to hone it more to get a true razor sharp edge. The point is very sharp out of the box. Will this work left handed? The knife is ambidexterous and can be comfortably used by anyone. I’m really impressed with this knife for one that costs so little. It’s one of the cheapest and most functional full tang knives I’ve found. I love the usefulness of it and the quality considering the price. 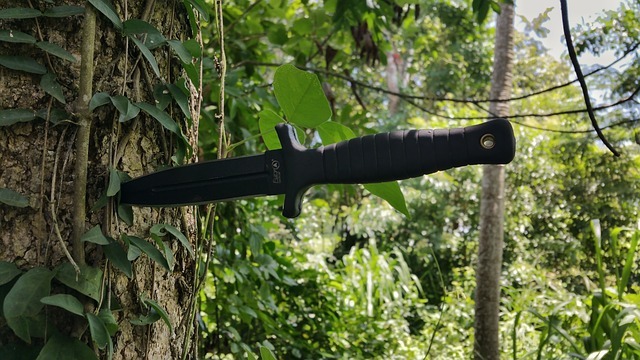 It’s the best boot knife for sure, and the versatile sheath is ideal if you don’t’ want to carry on your belt and want it concealed even if you’re small like me. The quality of this knife still amazes me and it’s so cool that it’s designed with a steel to specifically resist saltwater corrosion and with such a versatile dual edged carbon blade. If you want to know more about survival knives, check out my article on the features you should look out for. Are you a newbie to prepping? This is why you should hone your survival skills right away. Ready to add night vision googles to your survival kit? Check out my top recommendations for under $500. Does this knife have an American made counterpart? If not, what American made knife would recommend?